We’re all familiar with images of the surface of Mars, with the Tharsis volcanoes straddling the equator and the great gash of the Vallis Marineris just to the south. It’s a view seen in many orbital images of the planet, and one thought to have been more-or-less representative of the topography of Mars from the earliest times. However, new studies by geomorphologists, geophysicists and climatologists led by a team of French scientists, suggest that the surface of the planet underwent a gigantic “tilt” of between 20 to 25 degrees some 3 to 3.5 billion years ago, drastically altering its appearance whilst also offering an explanation for one of the mysteries of Mars. While a process known as variations of obliquity can cause a planet’s axial tilt to shift over large periods of time (Earth’s axial tilt of 23.4° is decreasing at the rate of about 47 minutes of arc per century, for example), this is not the cause of Mars’ shifting “face”. Rather it is the result of the massive Tharsis Bulge. The largest volcanic dome in the solar system, Tharsis is a plateau some 5,000 km (3,125 mi) across and around 12 km (7.5 mi) thick, topped by the massive volcanoes of Tharis Montes: Arsia Mons, Pavonis Mons, and Ascraeus Mons. 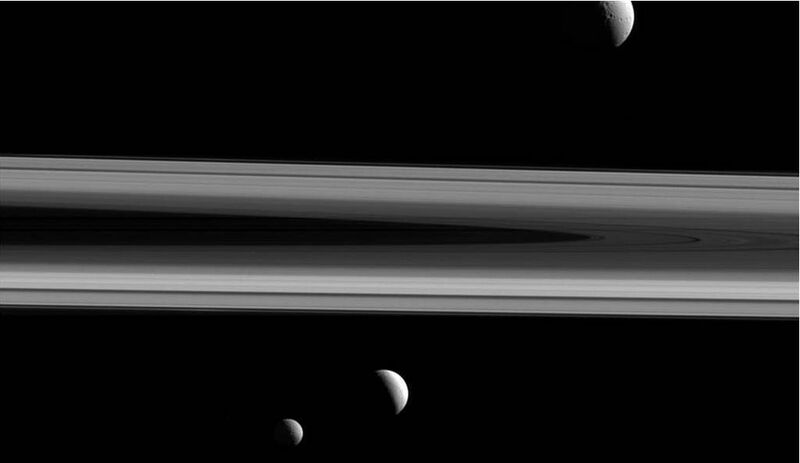 It formed over a period of roughly half a billion to a billion years, commencing around 3.7 billion years ago. The French research suggests that as the Tharsis Bulge grew as a result of volcanic activity, so it gained considerable mass – perhaps a billion billion tonnes), which caused the crust and mantle of the planet to “slip” around the core, rather like turning the flesh of an apricot around its stone. 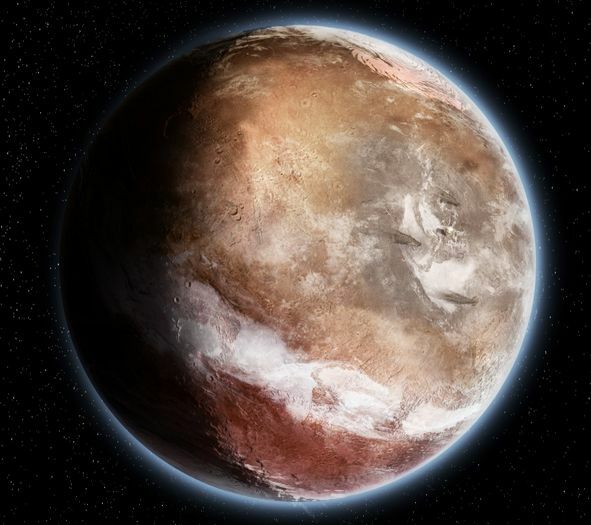 Thus, Tharsis appears to have “dropped” to the equator from a latitude of around 20 degrees north, completely changing the face of Mars during its first 1 to 1.5 billion years of history – the time at which life might have arisen, if it arose at all. While such a slippage had previously been suggested, notably through the work of Isamu Matsuyama of the University of Arizona in 2010, the French study is the first to offer definitive geomorphological evidence that this is the case. One of the major outcomes of the work is that it explains why Mars has huge and seemingly anomalous underground reservoirs of water ice located far from the poles. As the mantle and crust shifted, so they carried the frozen land which originally lay over the poles away from them, complete with the subsurface water and ice. Overall, the study radically alters the generally accepted chronology of Mars, which has Tharsis forming before the before the widespread creation of rivers and water channels on Mars. 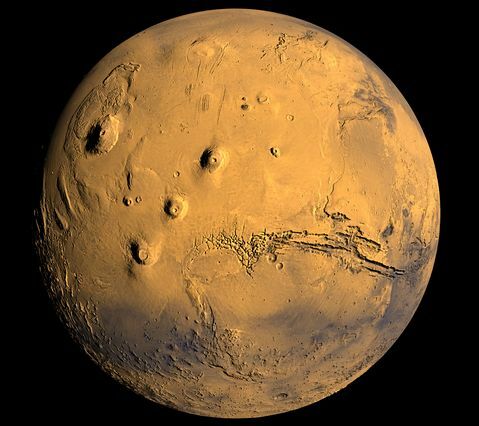 now it appears that Tharsis formed at a time congruent with the existence of liquid water on Mars and the formation of river valleys and other water features. Thus, the volcanic activity on Tharsis may have actually contributed to the period of liquid stability on the planet. 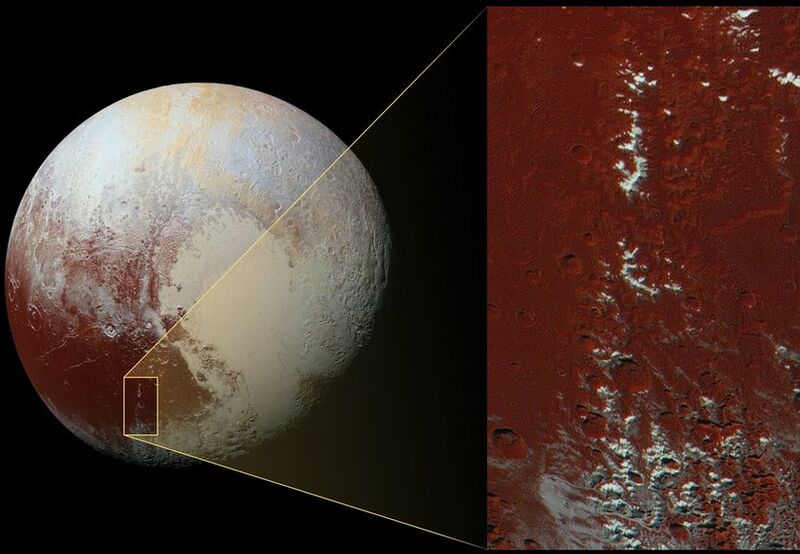 The New Horizons team has discovered a chain of exotic snowcapped mountains stretching across the dark expanse on Pluto informally named “Cthulhu Regio”, one of the minor planet’s more identifiable features, and which stretches almost halfway around Pluto equator, some 3,000 km (1,850 mi) in length and some 750 km (450 mi) across, with one end abutting the ice-covered flats of “Sputnik Planum” I’ve previously written about in my coverage of New Horizons. The high-resolution images show a mountain range in approximately 420 km ( 260 mi) long, the highest slopes of which are coated with a bright material that contrasts sharply with the dark red of the more usual dark red colouring of the region (thought to be the result of dark tholins, complex molecules initially formed by the reaction of methane and sunlight high in Pluto’s atmosphere, coating much of “Cthulhu Regio”. Scientists believe the white material could be methane which has condensed out of Pluto’s tenuous atmosphere to form ice, coating the peaks, much as ice can condense out of cold air on Earth to form frost. There has even been speculation that the white material is the result of methane ice condensing as “snow” and falling across the peaks. Crazy Eights sees Caledonia, Corwyn and Kayden reading from The Return of Sherlock Holmes every Sunday from the living room of 221B Baker Street. There has been a kidnapping in the north of England. The ten-year-old Lord Saltire, son of the Duke of Holdernesse, has vanished from his school, along with one of the masters teaching there. And while no ransom note has been received, the boy’s father has issued rewards of up to £6,000 for information on the whereabouts of his son or for information on his kidnappers. 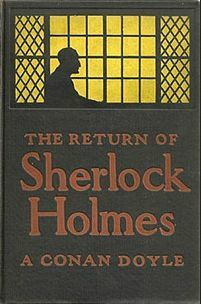 Dr. Thorneycroft Huxtable, founder and principal of the school, fearing for the boy, seeks out Holmes in London to seek his help in discovering what has happened, and to hopefully locate the young heir. An original tale written and read by Caledonia Skytower. Gyro Muggins commences a 3-part reading of tales concerning one of Philip José Farmer’s many memorable characters: Father John Carmody, and ex-con who painfully grew a conscience, but is still not entirely beyond benefiting himself. In A Few Miles, first published in The Magazine of Fantasy and Science Fiction, Carmody is ordered to the planet Wildenwoolly (think about it 🙂 ), but is given no funds for his journey and must therefore find his own way there. This proves taxing, with even reaching the space station where he might gain passage to his intended destination proving problematic. So problematic, in fact that he ends up “expregnated” by a large earthbound bird called a horowitz. With the egg now attached to his chest until such time as it hatches, Carmody finds himself the centre of scientific curiosity and study, something that might well allow him to achieve passage to Wildenwoolly under a lot more comfortable circumstances than he’d envisaged when first dispatched by the priesthood. However, as told in the sequel Prometheus, things take a bit of a right turn when he finds himself on Feral, the planet of the horowitzes, and cast in the role of educator for these strange birds, and as a sort of latter-day Prometheus, bringing them moral enlightenment. Caledonia Skytower reads Pam Muñoz Ryan’s Newbery Honour novel. Three entwined stories focusing on a magical harmonica, start with the tale of 12-year-old German boy Friedrich. He dreams of being a conductor; so much so that he cannot stop his hands rising to guide the music only he can hear. Such public displays, coupled with the birthmark which disfigures half his face leads to him being shunned and regarded as his peers as being Monster Boy. But then the harmonica enter his life, bringing with it change and hope. Two years later, and at the Bishop’s Home for Friendless and Destitute Children in Pennsylvania, 11-year-old Mike Flannery finds himself in possession of the harmonica. He and his younger brother are adopted by the wealthy Mrs. Sturbridge – only she doesn’t intend to keep them, but will have them separated and one of them set to another state home. Only the harmonica might offer Mike a way to secure his brother a place in the comfort and luxury of the Surbridge household. 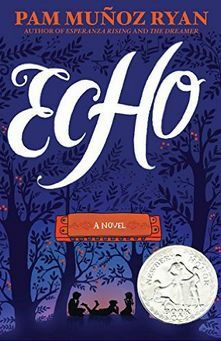 When she arrives in Ireland to visit her cousin Findabhair (Finn), American Gwen expects a fun backpacking trip to sites of the fairy lore they’re both fascinated with. 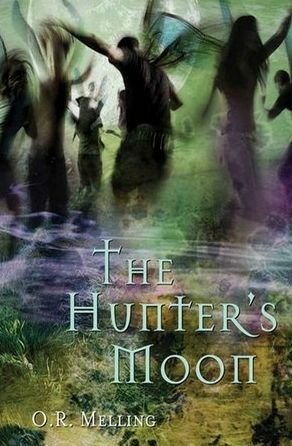 What neither cousin knows is that it’s the summer of the Hunter’s Moon, a dangerous time for mortals to meddle in the kingdom of Faerie. Whilst camping out, Finn is kidnapped by the handsome Faerie king, and Gwen must rescue her. In attempting to do so, she travels between modern-day and mystical Ireland. And when she does finally reach Finn, she finds her biggest challenge might be actually persuading her cousin she is in need of rescue! Shandon Loring brings us another tale about the formative years of legendary giant Finn McCool – Fionn mac Cumhaill – the mythical hunter / warrior who appears in folklore spanning Ireland. 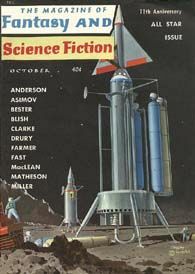 Contemporary science-fiction with Finn Zeddmore. Caledonia Skytower will be presenting Putting the Language Back Into language Arts Engagement at the 2016 Virtual Worlds Best Practices in Education Conference at 17:00 SLT on Friday, March 11th, at Idahionia – the University of Idaho. The featured charity for March / April is Project Children, building peace in Ireland one child at a time.